Today's Draw Classic*: Hanged Man from the Tarot of the Sidhe. Are you an earth-bound spirit? Or an earthling bound for spirit? If you have feet in both worlds, which foot will you lift first? To me, the Hanged Man means one of three things—time spent in suspension/waiting, taking a look from a different angle, and a voluntary sacrifice. But within Emily Carding's illustration and lwb (little white book) she includes a few interesting nuances. First is that her Hanged Man is not tied upside down to a tree limb, as most Hanged Men are. He's "falling up" toward a holier reality. He gives himself up to the vortex pulling him in, but with his foot momentarily caught in a branch, exists in both worlds. As if at a vertical fork in the road, he must choose to remain suspended and unchanged, or release himself never to be the same again. He chooses to let go and be reborn. To be holy on earth. Yesterday we spoke of a death...the death of the "I" that happens when we become a couple. In this card, we see a different aspect of ego death. It's more of a death of the I to become "one"...to become part of the universal "we" that exists between God and everyone. 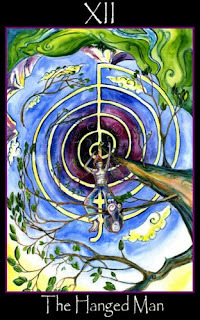 In the moment of the Hanged Man, though, he is in both places at once. He is holy and human. And as he releases his foot, he falls up into the Death card, the next card in the deck and card of his ultimate transformation. In the context of this discussion, he falls into the ultimate "oneness" of being, where we're not just walking in step with spirit, but with all things. Personally, I believe we are all the Hanged Man. Holy and human. A spirit bound to the earth. A spirit on a human experience. But most see things the other way around...that we're humans on a spiritual experience. Or they don't think much about the distinction at all...haha. The difference between the two is critical and colors how you see yourself and your journey here on earth. Either you're a perfect, holy being who came here to experience the path of the human. Or you're a human who came here to experience the path of spirit. Either you came here to remember your true nature. Or you're here to forget your true nature. Knowing which you're here for is crucial to knowing why you're here and how to proceed while you're here. But regardless of which you believe, you still have feet in both worlds. You're still tasked with justifying or unifying both worlds. There's still some "I" to sacrifice to be "one". You're still in some way bound to a foreign world. It really just comes down to which one you think your soul calls home.